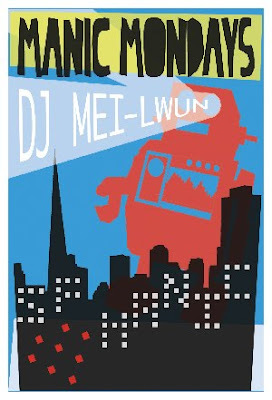 MLNP: Don Lynch n me get MANIC this Monday SF!! Where Mission hipsters meet Marina and Marin, Art students talk to med students, Djs dance with promoters and models drink whiskey with scientists. MANIC MONDAYS is the epitome of San Francisco. Get ready for another bitchin' MANIC MONDAYS this coming Dec 21st with resident and host DJ Mei-Lwun plus special guest Dj Don Lynch (Video Set) playing Hipster-Hop and Electro-Pop. No cover. Come with a smile. $4 Fernet $7 Fernet and a beer or Corralejos! We offer bottle with wine starting under a $100 for a reserved table, a few friends and a bottle of wine and you are pimpin sf steez! !